Aging, as well as certain diseases, make us lose facial tissue (fat, collagen, muscle and bone). The skin also changes due to reduction in collagen and elastic fibers. This makes the skin thinner, lax and more transparent, making the blood vessels under the skin more visible (this is, in part, due to the loss of fat under the skin). Gravity also plays a role in aging, lowering the cheeks, changing the lower jaw line. Fillers can correct the effects of aging by adding volume (correcting fat, muscle and bone loss that normally occurs with aging) and “plumping” the area. With fillers we are capable of changing some facial features and avoiding surgey. Small chins can be augmented, cheeks and cheek bones can be augmented, facial imperfections can be improved, dorsal aspect of the hands can look fuller (veins less visible). Lip enhancement is another area where fillers can make a significant improvement. It is important to understand that not all the fillers can be used in all areas, and selecting the appropriate filler is very important. Fillers classified as biodegradable are absorbed by the body and tend to have a shorter duration of effect. Fillers classified as non-biodegradable have components that do not degrade. These fillers may yield excellent longer-lasting results, but they tend to be less forgiving and are associated with an increased incidence of granuloma formation and/or extrusion. Some dermal fillers operate in a more passive manner, occupying space until the injected material biodegrades. These products are known as tissue replacement fillers or “volumizers;” they have limited action and must be repeatedly injected to yield continuing results. Other dermal fillers, known as “stimulators,” induce an inflammatory reaction with the goal of stimulating collagen production. Neo-collagenesis is believed to yield both longer-lasting treatment results and possibly other benefits to the dermis. 1. Hyaluronic Acid (HA): HA is a naturally occurring polysaccharide found in the extracellular matrix in many human tissues. Approximately 50% of the total HA in the human body is found in the skin. These fillers do not produce allergic reaction. The following fillers belong to this group: Juvederm Ultra, Juvederm Ultra Plus, Belotero Balance, Restylane and Perlane. 2. Stimulatory Fillers: These fillers are based on calcium hydroxylapatite, a naturally occurring mineral component of human bone and teeth. The dermal filler is composed of CaHA microspheres (30%) suspended in an aqueous carboxymethylcellulose gel carrier (70%). This dermal filler injection provides immediate correction, but it is believed to generate longer-lasting results by providing scaffolding for collagen growth. Following injection, the gel carrier is absorbed and new collagen occurs around the slowly biodegrading CaHA microspheres. The patient’s own collagen production thus contributes to the prolonged effects. Some fillers in this group are Radiesse and Sculptra. Stem cells are biological cells found in our bodies. They can divide and differentiate into diverse specialized cell types, and can self-renew to produce more stem cells. These include embryonic and adult stem cells. ES cells are collected from an embryo from the fertilization of an egg to the formation of a fetus (five to six days after fertilization). Because of their ability to grow into any type of cells in the body, ES cells are also called pluripotent stem cells. Adult stem cells collected from human tissues are in an undifferentiated state. Found in the bone marrow, blood, cornea and retina in the eyes, liver, and skin, adult stem cells are master cells that form individual tissues. There are bone marrow stem cells, hematopoietic stem cells and mesenchymal stem cells. Adult stem cells are much less likely to induce rejection than ES cells collected from another person’s fertilized egg. Among the adult stem cell groups, the mesenchymal stem cells, or MSCs, are multipotent adult stem cells that can differentiate into a variety of cell types, including bone cells, cartilage cells, fat cells, muscle and tendons. MSCs encompass multipotent cells derived from bone marrow, umbilical cord blood and adipose tissue. 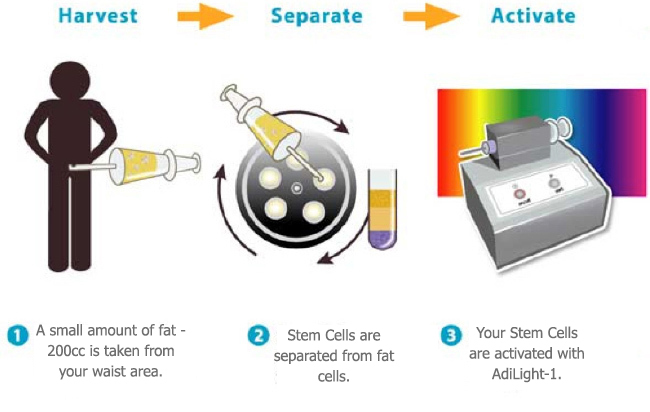 In our practice we use adipose stem cells. We feel adipose tissue has shown to be an excellent source of stem cells, and they are less affected by age. As an individual matures, the face ages. This, of course, is not an overnight phenomenon, but, as a rule, is gradual, occurring over a period of years. This face aging is actually a function of several physiologic changes that occur with time. The collagen in the face becomes less elastic and allows the soft tissue features of the face to sag inferiorly. In addition, facial fat is generally lost with age, making the facial soft tissues thinner. Finally, the facial soft tissues gradually atrophy, compounding the visual thinning of the facial soft tissues, as well as making the facial bones appear more prominent. The cheeks sag inferiorly resulting in the appearance of jowls. The corners of the mouth move inferiorly resulting in a slight frown look. The tissues around the eyes sag inferiorly. The eyelids, upper and lower, themselves sag inferiorly. The tissue of the forehead drifts inferiorly, creating wrinkles and dropping the eyebrows downward and giving them a flatter appearance. The nose may elongate and move the tip inferiorly. The nose may develop a small to pronounced dorsal hump. The tip of the nose may enlarge and become bulbous. Generalized wrinkling of the face may occur. The loss of volume in our face and natural contours of our body are telltale signs of aging. Hollows that appear in our cheeks, as well as around our eyes, can make us look and feel older than we really are. Fat transfer is an aesthetic procedure that takes fat from one area of your body and relocates it to another area of your body to restore lost or uneven volume and contours. The fat is used as a natural injectable to treat areas such as the face, breast, buttocks and hands. With the Adivive Fat Transfer System your own fat is harvested through liposuction from areas such as the stomach, love handles, thighs or wherever excess fat is located. If you are already undergoing a body contouring procedure, then fat can be harvest before the laser is used. The harvested fat is then centrifuged, filtered and injected into the desired treatment area. On the face, fat injection can be used to plump areas such as hollow cheeks and around the eyes, restoring lost volume. On the body, fat injection can be used to treat areas such as the hands, breasts and buttocks to restore natural contours for a fuller, youthful look. For those who are seeking a natural approach to looking younger, fat transfer with the Advive System is an excellent choice. This procedure can deliver dramatic, natural-looking results that are long-lasting. Fat Transfer with the Adivive System provides a natural alternative to synthetic fillers and implants by using your own fat. It delivers dramatic, long-lasting results, and offers less bruising and swelling. Through the system you may achieve dramatic results after just one treatment, and the system restores volume without synthetic fillers or implants. It can also last 10 years or more, compared with fillers that will last a little more than a year or less. In addition, it is a more cost-effective procedure.